Since dissimilar substances conduct heat to varying degrees, exact heat capacity can be described for each substance. The specific heat capacity is a compute of the amount of heat needed to elevate the temperature of one mole of the substance thoroughly. 1. 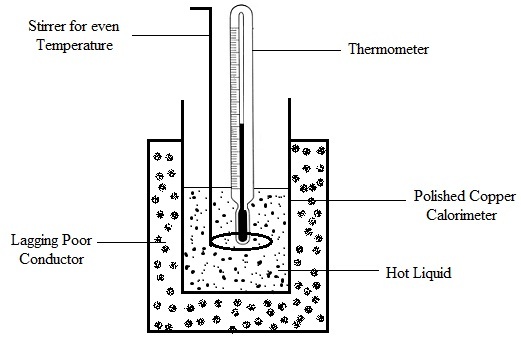 Assemble a calorimeter as given in figure 1 or 2. 2. Transfer 80cm3 of distilled water (use a measuring cylinder) to the calorimeter, close the top and insert the thermometer and stirrer. 3. Stir until the temperature is steady, then record that temperature as Tiw (initial temperature of water) in your note book. 4. Prepare a boiling water bath with about 4cm3 water in a water bath. Whereas it is heating, weigh precisely the copper metal. 5. Situate the copper metal in the boiling water and boil for 10 minutes. Record the temperature of the boiling water as Tim (initial temperature of metal). Permit the thermometer to cool before replacing it in the calorimeter or we utilize the spare thermometer. 6. Using a pair of crucible tongs, quickly eliminate the metal from the boiling water and watchfully situate it in the calorimeter. Close the calorimeter and stir. Carefully not to break the thermometer, it shouldn't contact the metal but must be immersed in the water. 7. When the temperature is steady, record it as Tfw and Tf m (final temperature of water and metal correspondingly). 8. Empty the calorimeter, allow the metal to cool to room temperature and repeat the procedure. (wm is weight of metal and ww is weight of water, while Cm and Cw, are specific heat capacities of metal and water correspondingly). The weight of water might be estimated from the assumption that lcm3 weighs 1g, whereas the specific heat capacity might be assumed to be 4.18j/g.deg. (1 cal./g.deg.). The heat of reaction is the amount of heat liberated or absorbed for a specified amount of reactant or product. If the reaction is carried out at steady pressure, the absolute value of the heat of reaction is equal to the absolute value of the enthalpy of reaction. The heat of reaction is computed via the use of calorimeters. The neutralisation reaction to be studied is the reaction between aqueous sodium hydroxide (NaOH) and aqueous hydrochloric acid (HCl). Sodium and chloride ions don't participate in the reaction since they remain ionized in aqueous solution. The reaction of interest is hence. Which is exothermic. The amount of heat liberated is proportional to the number of moles of acid neutralized, and can be computed from the volumes and concentrations of reactants utilized. For a strong acid and a strong base, her heat of neutralisation is about steady at a value of approximately -57.5kJ per mole of water produced. This value is almost a steady since the reactants and products are all entirely ionized in the water medium. If however, the acid or the base is weak, the heat of neutralisation would be different from the 57.5kJ per mole. In such a case, the weak acid or base would only be slightly ionized. The reaction taking place rather being a straight forward neutralisation reaction between the acid and the base, would consists of 2 stages of reaction therefore: if the acid is the weak component for instance, the 1st stage will involve the completion of the ionization of the weak acid. It will have a resultant heat transform which would be different from the 57.5kJ per mole. 1. Accurately measure out 40cm3 of the NaOH supplied (record its concentration) into a clean dry calorimeter. 2. Into a clean measuring cylinder, measure 40cm3 of the 1MHCl and record its temperature as T such as (initial temperature of acid). (The molarity of the acid is slightly greater than that of the base so that the reaction mixture is acidic at the end of the reaction, to ensure that the reaction was complete). 3. Rinse and wipe the thermometer, then find out the temperature of the base in the calorimeter and record it as Tib. 4. Quickly but carefully add all the acid to the base in the calorimeter, replace the lid and stir. Whenever the temperature is steady, record it as the final temperature of both acid Tfa and base Tfb. 7. Compute the heat of neutralisation for the reaction, using the given assumptions and equations. 8. The heat lost via the reaction is equal (but negative) to the heat gained through the solution. and solution = Tfa and base Tfb .